Hi, unknown internet person! I’m Sergey, enchanté. You are probably here because you want to find out who I am, so I will try to be brief. Mostly, I am a game and level designer. I have worked on projects like Rime (Tequila Woks) and Event (Ocelot Society), and I’ve also made a bunch of award-winning and award-pending indie games, including Dédale, Lune and Paradis Perdus. 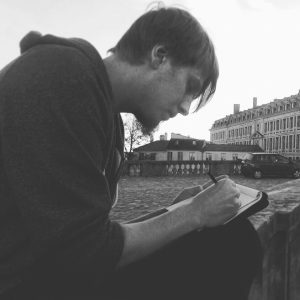 I’m a co-founder of Ocelot Society, a Paris-based indie studio seeking new ways to play. I also write things sometimes. Actually, I wrote a really long Gamasutra post about my path in the industry if you’re into that sort of thing. I also wrote a book on Unity’s visual scripting plugin called Playmaker. Before being a game developer, I was a game journalist. I worked at PC Gamer Ukraine, and before that, I wrote for a small weekly magazine that you have probably never heard of. Anyway, thank you for checking out my website and don’t hesitate to contact me if you have any questions. And a little disclaimer for people who follow me on Twitter: I have no idea who created @sedirk. Seriously.